I first encountered the work of Rosie Reed at last year's Royal College of Art degree show, and Instagrammed it instantly, the splatters of paint and bollard-like shapes coming together to form an absolute party of a sculptural installation; it was one of my picks of the degree show and her latest works are, for me, the heart of 'Flipside', a group exhibition she has curated at Fold Gallery. The inspiration that brings the works together is Ursula le Guin's text 'The Carrier Bag Theory of Fiction', and the gallery also provides a supporting booklet with additional written and visual responses to le Guin's writing from Reed, Jakob Rowlinson, Connor Harrison, Laura Dee Milnes, Lotte Andersen and Joel Chan and Sarah Howe. Rosie Reed, Burying My Minimiser (Amongst Other Things), 2018. Marble dust, aggregate, pigment, paint, glitter, PVA, resin, jesmonite and plaster, 175cm x 58cm x 18cm. The show's subtitle is 'The opposite, less good, or less popular side of something', while le Guin's text critiques the 'Story of the Ascent of Man the Hero', where the patriarchy has been supported by the male figure providing, fighting and hunting for the family and for society. Exhibiting work as a response to this is a far more interesting idea than the all-female exhibition concept, which more times than not simply acts as an example of positive discrimination instead of providing a narrative worth discussion. 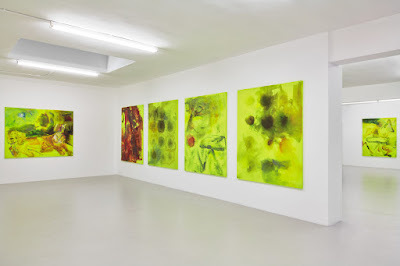 Reed has done an excellent job curating the show, with eye-catching works generally assigned to the gallery corners, with smaller works positioned either above eye level or on shelves, such as Saelia Apararicio and Paloma Proudfoot's collaborative sculptures. A variety of themes addressed keeps the show fresh and compelling. In 'The Carrier Bag of Fiction', le Guin talks about the falsehood of the role of the heroic male hunter, stating that in fact the prehistoric diet consisted mostly of vegetation and seeds. Instead, she proposes that "the restless ones who didn't have a baby around to enliven their life, or skill in making or cooking, or very interesting thoughts to think, decided to slope off and hunt mammoths". Ideas of civilisation, nature, femininity and masculinity are fleshed out, often with amusing tones. Kira Freije's cast aluminium and steel sculpture 'Beneath the Higher Worlds' sees a human-sized structure on its knees with its arms flung in the air; despite having no facial features the emotions in the figure are palpable, and the viewer can never quite decide whether the character is in agony or ecstasy. 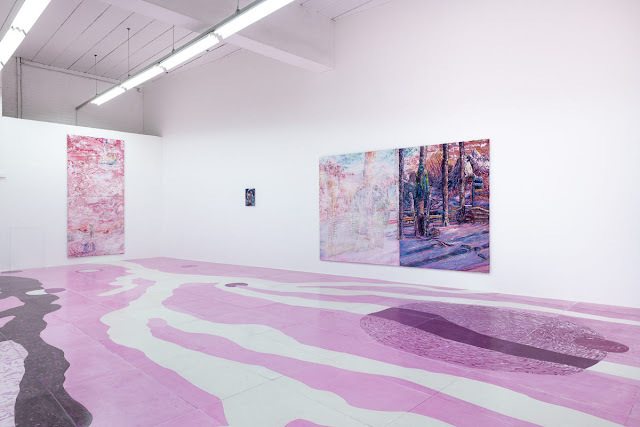 Installation view: Kira Freije, Beneath the Higher Worlds, 2018. 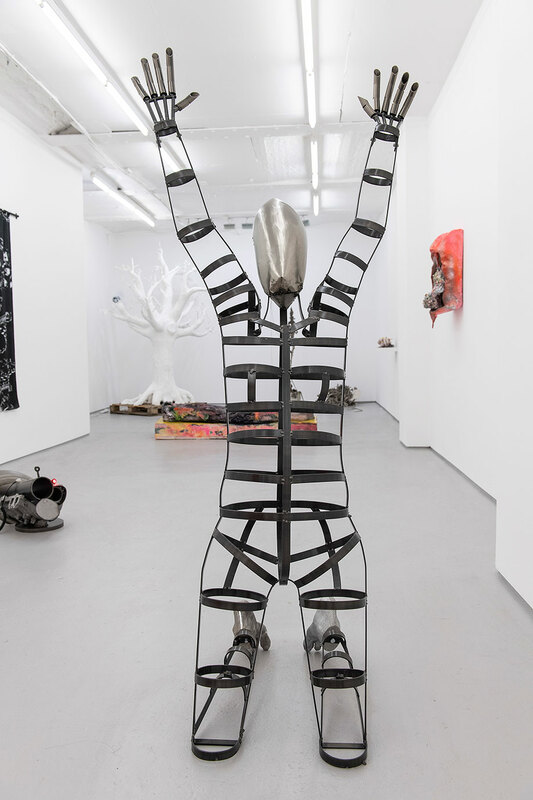 Cast aluminium and steel, 176cm x 80cm x 67cm. The idea of a feminised 'Mother Nature' is elaborated on by Reed's piece 'What's This Then? 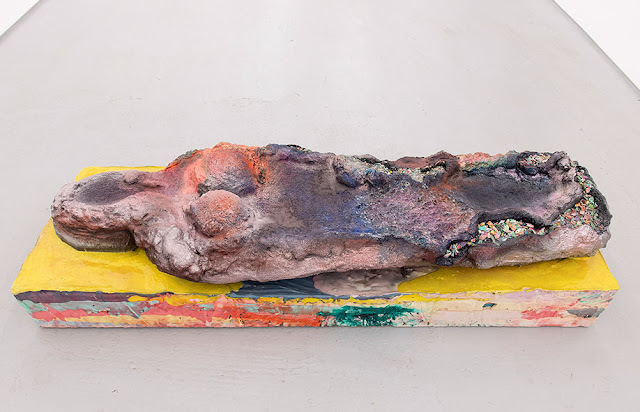 ', a mixed media piece where the natural is contrasted and perhaps satirised by the artist's choice of an electric palette of pinks and other vibrant colours. Its form of a platformed sarcophagus with breasts is a stark reminder of not only humanity and morality but also consumption, with glitter being the 'fun' twist on what is at face value a fairly morbid foundation. 'What's This Then?' complements two pieces in particular very well, both by London-based Joel Chan, who also graduated from the Royal College of Art last year. The first is 'The Wind Continues to Blow and I Don't Wanna Leave [Maquette for Bronze]', a Plaster of Paris tree painted white, with one branch holding a motorised air fan blowing a plastic bag which is stuck to another branch; this artificial idea of nature, with the tragic symbol of the plastic bag, makes a strong statement in isolation. 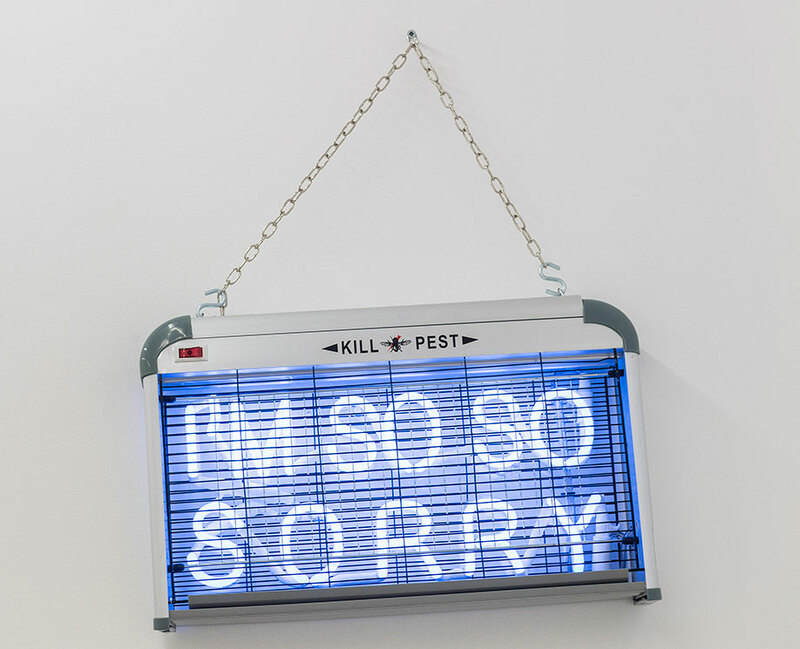 Chan's second work, 'Sometimes I Laugh When Others Fall Over' is modelled by society's nonchalant destruction of nature and natural beings, as the wall-based work is an altered insect eradicator, its neon spelling out the words "I'm so so sorry". 30cm x 49cm x 8cm. An exhibition where artists respond to a text, or theme, is a real treat, and can attract a general audience to texts they may have not encountered before; le Guin's essay is easily digestible, as are the accompanying essays circulated at the gallery. Specially commissioned and created works inspired by the essay show that the gallery, curator and artists alike are truly committed to the idea. 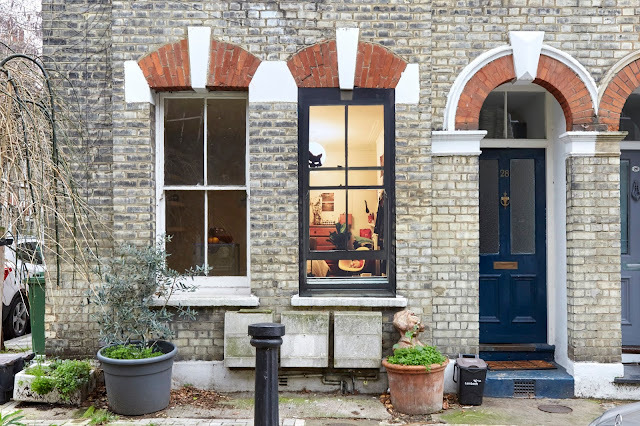 In the case of 'Flipside', this has resulted in a selection of high quality work from artists I hope become more of a regular fixture in London's art scene.